Big news are coming about an update of Facebook Messenger. Following WhatsApp’s example, you will now be able to quote messages in Facebook Messenger. And this comes in hand when you don’t remember an answer exactly or have doubts on what someone said. Why is this new quote feature helpful for the users? Being in a large messenger group or having long conversations with specific friends can easily get you confused about topics or answers you or your recipient gave. Of course, the search in Messenger feature can be of help, but if you want to underline some specific information or to reply to a specific answer, you had to copy paste it and maybe create confusions with the recipient or recipients you were talking to. With the new feature, it will be easier to do this from now on. When you want to quote a message reply in a conversation, you just have to long press on the text you want to reply and then select the “Reply” icon and do your thing. The types of messages you can reply to are the text ones, photos, videos, emojis and even GIFs. So there is no barrier in quoting. The message reply won’t interfere with the rest of the chat, like they won’t look different, but it is still a good move. This move from Facebook comes after giving the possibility to people to react with emojis to messages they send or receive. 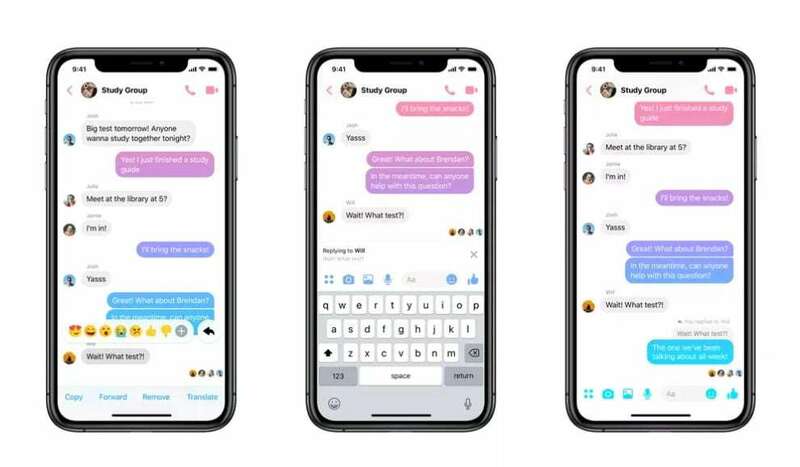 As we already said, this new feature is similar to WhatsApp’s one and it might bring Facebook closer to unifying its messenger platforms: Facebook Messenger, WhatsApp and Instagram Direct Messages. What do you think now of Facebook messenger with a new quote feature? Do you think it is useful? Or just part of Facebook’s masterplan of merging WhatsApp, Facebook Messenger, and Instagram Messenger?